Note: This column was published in the Barrow Journal on March 26, 2014. Sometimes I worry that I don’t give my four-year-old enough attention, but then again, sometimes I worry that I don’t give my seven-year-old enough attention. In truth, it’s probably about even. For three years, my oldest son had all my attention, but his younger brother has had to compete ever since he was born. I have to remind myself that my four-year-old got a lot of things his older brother didn’t get. Since he was a baby, he’s been carried along to play dates whereas I didn’t know many mothers with infants and toddlers when I first had children. He’s also been taken to his older brother’s classes and been around big groups of children of all ages from day one. Right now I’m very focused on my “first grader.” Reading lessons, math lessons, book time, computer time, conversations about history and cultural events, and most of all, his projects. We are project-based homeschoolers, which means that I set aside time for my son’s interests and use some “tricks of the trade” to get him to study deeper than the surface of those subjects. My four-year-old has interests too, and lately I’ve been considering how I can make more time for his projects and lessons. I don’t think that at four-years-old, academics should be a priority, but by letting him explore his interests, he is learning everything a four-year-old would typically learn in preschool anyway. Right now he loves letters and numbers. He hasn’t mastered the ability to identify all the letters like my oldest son did at an early age, but he’s taking a different approach. He loves to sing the ABC song, and by singing it with him every night, he has mastered it. He loves to count everything, and we often overhear him counting when he’s playing by himself. He loves to play our math games even though they are too hard for him, and sometimes he’ll play by himself when no one else is available. He uses some tiny little, rubber vehicles (manipulatives) to help him add and subtract. Whenever he tells me to draw or make him something, I encourage him to try to do it himself first. He never wants to. I guess he knows his own limits. I started to get frustrated about this, but then I remembered all the “art” he makes on his own. You might call it “abstract” art, but it takes some time and thought. 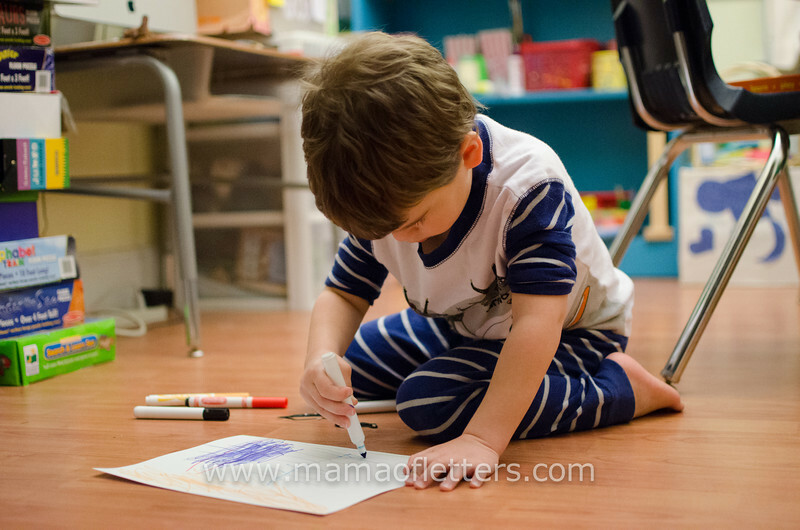 He is very calculating about applying different colors of paint all over one piece of paper, drawing line art, or cutting and taping paper together to make interesting shapes. I’m glad he’s felt free to “create” whenever he wants to, and I have a nice collection of his work to save in a memory box. When you have more than one child, it’s easy to worry about whether or not you’re giving them their fair share of your time, but in many ways, both boys have benefitted from not having my full attention. They occupy themselves. And when I stop to chronicle everything they do, I’m pleasantly surprised that quite a bit gets accomplished without me even trying. Hi Kirsten! Where are you? A four-year-old in 1st grade or a kindergarten/preschool class? Wow, that’s young if it’s 1st grade! Here, kids typically do pre-k at 4 years old (and many families put them into preschool even younger – to me it’s more of a babysitting operation), and kindergarten at 5 years old, and 1st grade at 6 years old. However, to enter kindergarten, they have to be 5-years-old by September 1st. Well, my son’s birthday is only a few days before that. So I thought to myself, if he were born a week later, he would have to wait another year. If I put him in then, he would be the youngest in the class, and I knew he wasn’t ready for that. (Some kids are more than ready. It depends on the kid.) Of course, all of this doesn’t matter because we homeschool, and I think grade levels don’t mean anything anyway – a child’s education should fit their needs and go at their pace. This is what I do. But I have gone ahead and called it “1st grade” because that’s approximately where he’s at, and I think it’s easier for other people to understand what we’re doing that way. And I personally like to have some goals and guidelines as I move along in his education, although I don’t force anything, if I don’t think he’s ready for it. Thank you so much for your comment! I think it makes sense to have goals and guidelines – even if you don’t force anything. It’s just good to bear them in mind, I think. Yes, here everything starts very young! Preschool starts from the term after the child’s 3rd birthday, and most people put their kids into that. (I think a lot of people think it’s compulsory!) It’s about 12 hours a week, I think, spread across the week. Children here start their first year of full-time, formal schooling (primary 1) when they’re 4 or 5 (depending on when birthdays are. If they have March – July birthdays, they’ll start in August when they’re 5, but otherwise they’ll start when they’re 4. I think that’s right anyway – hard to get my head round!). If the birthday is December / January / February, you have the option to defer til the following year if you like, but most people don’t. My son’s birthday is in December and I was determined from the time he was born that he wouldn’t go to school when he was 4, and that we’d defer. But he’d already had a year of preschool and he was academically so ready for school that I knew he’d be terribly bored with another year of preschool, so we went for it. Primary 1 was fine, but things haven’t gone so well since then – which is why we’re now homeschooling! I think that if there had been something else between preschool and primary 1 that wasn’t formal schooling, we would definitely have done that instead at that stage. Sadly there just aren’t a lot of options. It’s so young! my boys are spaced three years apart as well, and it has been great. they did some projects together when they were a little older than your boys. so much fun. Thanks, Lori! Yes, of course he has interests and projects! But I’m afraid I’m such a distracted person that I don’t always think about it that way. At least I have my house set and lifestyle set up so that things like this happen on their own without me even trying! It’s far easier for me to identify + support my 5yo with projects (and she’s been at it since about age 3) than it is for my older homeschooled child. That’s a combination of many things, I think: my older child’s 3 years of schooling, his personality, and the fact that my 5yo knows no other way. Hi! Thanks for sharing. My son is 4 as well and we have started some project-based homeschooling with my oldest daughter, 7 years old. I usually let my son play a lot. He plays very well by himself with his toys all day. I would like to get him more interested in doing some projects of his own but all he wants to do is play with his toys. He is just becoming more and more interested in having us read many books to him, but still loves to play with his toys practically all day. Do you think it would be good to start pulling him away from his toys more? How does it work for you and your 4 year old in a typical day? Hello & Thanks so much for your comment! No, I would not put away his toys. In project-based homeschooling, you start with your child’s interests – THAT is his interest! I think it’s wonderful that he plays so well all day long. Imagination, creativity, independence! That’s such a great skill to develop at this age, and it certainly helps you! My son is similar. He entertains himself very well, although of course he needs some mommy time too. You might want to start a journal and document exactly what your son does all day. Do you see any patterns? For example, when I stopped to think about it, I realized how much my four-year-old did with “dinosaurs” as I mentioned in the post. If you see something like that, you could always add some books on the subject or take him somewhere related like a museum. Do you have craft/art supplies out where he can reach them? Take the time to show him how to use these materials (my kids LOVE air dry modeling clay). If you see an interest in his play, you could suggest he draw or make something similar. (Could he make a replica of one of his favorite toys?) (Or you do it and let him watch. Sometimes if a child doesn’t like using a certain material at first just letting him watch for a while will get him to do it on his own at a later time.) I did that with my kids for a while, and now they do those things on their own! My son loves to play with toys too, especially his dinosaurs (obviously), little cars and animals, and he LOVES pretend food. We have some pretend veggies, sandwich set and pizza, and I gave him some old pots and pans. We got a small hand-me-down small oven, and he can just go to town cooking. I also notice that he loves to help me in the kitchen. (And come to think of it, he made a little pizza out of modeling clay the other day!) Playing with open-ended toys like that is so good for children. I would not stop that at all. Both the boys love to build with blocks & Legos too. Those all count as materials to use with project-based homeschooling! One thing I did that helps is that I put all our open-ended toys such as the animals, blocks, food, etc. downstairs and the noisier more annoying toys are upstairs. They don’t play upstairs very much except on rainy days, and it’s gone a long way in developing their creativity. Also downstairs is all the craft supplies which is within their reach (you can’t worry about messes if you want to do PBH!). It’s also great because having all those other toys upstairs is a treat on rainy days or when friends come over! As for your question about how it works for me and my four-year-old, as I mentioned in the post, I spend more intentional project time with my seven-year-old. Days move so swift that I can’t quite wrap my head around making intentional time for the 4yo’s projects yet. BUT, they happen on their own, spontaneously. Right now I encourage him by taking photos of his artwork and showcasing them in the house. When we go to the library I ask him what kind of books he wants, and so far he always says “dinosaurs.” I think as he gets older, things will just work out. When I get a chance, I’m going to give him more drawing supplies, I’ll have him cook with me more, we’ll do more dinosaur related things. He will probably request more as he understands more of what he can do. Projects don’t necessarily have to happen in a tidy package. What is great about PBH is that projects can be very long and happen over a long time – which is much better for learning and retention! Some of these interests will peter out, others will come, and maybe some will stick around – those are the ones I’ll be paying the most attention to. I hope this helps you! Please keep in touch and let me know if you have any more questions! Thanks so much! That all certainly helps! I suppose that I have been wondering more about his toys because they are Teenage Mutant Ninja Turtle figures that he plays with pretty much all day. My son and his dad are both into those kinds of toys as well as other super heroes too. I really want my son to have more open ended toys like you listed above, but we don’t. I plan to get some some day when we actually have the funds. We have a few games and puzzles that he does enjoy from time to time. I’m just not so sure that the toys that he plays with are the best toys for him to have. Perhaps I’m thinking about it too much but just want to always be aware and open to change. I certainly need to display his work more around the house. I try to have materials where he can reach them but I have to be extra careful with the house because it is a rental and accidents do happen. I love everything about PBH. Your blog is very helpful and we enjoy PBH. Just wondering more, now, how to incorporate my 4 year old. Thanks for responding! I wouldn’t worry too much about the toys. Eventually he’ll hook onto something else, but these may last a long time. Maybe you could slyly compare the Ninja Turtles to real turtles? Get some books at the library or watch a documentary or movie about sea turtles. You never know what might capture his interest. If it doesn’t, that’s okay too. He may be too young, but there’s also the angle of learning about real Japanese Ninjas too. Maybe he could find you one day drawing a Ninja Turtle or sculpting one. (BTW, a big box of air-dry modeling clay is only about $8 at Hobby Lobby.) Or make one with toilet paper tubes and cardboard? I wouldn’t worry about buying new toys, if it’s not in the budget. One thing I’ve done is just slowly add things to our stuff, especially the craft materials. Luckily little bags of pons pons and goggly eyes, etc. are not too expensive. Every Christmas I usually go get some things like that and put it all in a box and that’s one of the boy’s presents. They think it’s fun. I’ve also asked grandparents (especially if they ask us what we need) for specific stuff. My son has gotten a lot of his Lego kits that way – they tend to be more expensive. My seven-year-old is just starting to get into super heroes, and as a result, my four-year-old is watching all those programs too. But whatever your child’s interests are – that’s where you begin. There’s definitely a learning curve when Mommy doesn’t care for the subject! I totally sympathize. While I would prefer for my son to play all educational games on the tablet, his dad has downloaded lots of “fun” games, including Angry Birds. (I think he’s just killing pigs in it or something?! IDK.) Anyway, I was pleasantly surprised to find him making a raft out of popsicle sticks – an idea he got from that game because there’s an image of the birds floating on the raft. And then he made several “angry birds” with pom poms and felt, etc.! So you never know what might promote productivity and imagination in your children! Great ideas! We checked out some books about turtles once because he said he wanted to, but he specifically thought we were checking out books about TMN turtles! He wasn’t very interested in real turtles. He does seem like he would be interested in real ninjas, so we will see where that goes. You are right about interests coming and going and some sticking around longer than others. Getting craft materials for Christmas gifts is a great idea! I have hinted at the grandparents about getting these kinds of things for the kids at Christmas but the consensus is that it is no fun for them to give these things to the kids! They will bring over a craft every few months or so which is cool! I really like the idea of participating in his interests by sculpting or drawing his toys with him! He would love that! I do figure that my son and husband taking interest in the same toys comes down to bonding between them and I shouldn’t worry too much. It’s really neat to see them form their relationship. I am always amazed at how well my kids teach themselves just by seeing an image or hearing something from the most unseemingly places! That’s great that your son spotted that raft…very cool! All of this totally sounds like the things I would do and makes total sense. Thanks so much!